In the context of parasite control "dusting" consists in directly treating the animals with insecticidal dusts (instead of liquids). Such insecticidal dusts are designed for direct on-animal use without previous solution in water, i.e. they are usually not soluble or dispersible in water. This is in contrast with wettable powders (or granules, pellets, etc.) that are concentrated pesticides designed for being dissolved or dispersed in water before dipping or spraying the animals. However, there are some products that can be used for both purposes. In poultry and pig operations such dusts are used both for off-animal treatment of manure, bedding and premises as well as for on-animal treatment of the animals. 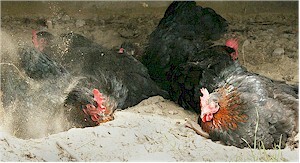 Dust bathing is a natural behavior of hens (much less of roosters! ), many other birds and even mammals. Many animals do this to eliminate skin parasites. Taking advantage of this, if an insecticidal dust is added to sand boxes or to the bedding of the birds, their spontaneous behavior will result in insecticidal self-treatment. Pigs do not dust themselves as hens, but dusts are sometimes used on them too. As a general rule, dusting is less effective than power spraying, especially against mites and lice species than may infest the ears and other hidden body parts, as well as against parasites that remain on the animals only for bloodsucking and otherwise rest in their hiding places (e.g. the red poultry mites, bed bugs, etc.). In cattle operations insecticidal dusts where quite popular for the control of lice and flies (mainly horn flies and face flies) 30 to 60 years ago, before the introduction of more potent and convenient ectoparasiticidal pour-ons and ear-tags. A particular form of dusting are the so-called dust bags that hang in a property in places where the animals go through once or twice a day (e.g. water troughs, salt and mineral stations, etc.). Dust bags can be arranged in a way that animals have to come in contact with them (forced use) or not (voluntary-use). 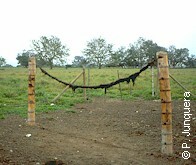 In both cases the bags are hung in a way that cattle touch them with head, shoulders and backs. When slightly shaken the bags release insecticidal dust onto the animal. These dusts are usually not sufficiently effective to protect cattle against other parasites such as ticks, mites and other fly species (e.g. stable flies), which means that additional parasiticide treatments are often required. Such bags need frequent maintenance for re-filling and repair. Insecticidal dusts and powders that are similar to those used on poultry and pigs are also used on dogs and cats. Dusts are also used on cattle and sheep as dressings against various fly maggots (of screwworm flies, blowflies, etc.) that can infest accidental injuries as well as wounds caused by livestock management practices such as dehorning, docking, mulesing, etc. Theese dressings contain various insecticides that are effective against the fly larvae, i.e. they have a larvicidal efficacy. Dressings for the same purpose are also available in the form of sprays, aerosols, ointments, creams, etc. Insecticidal dusts contain mostly old generic active ingredients such as organophosphates (e.g. coumaphos, malathion), carbamates (e.g. carbaryl, propoxur), and synthetic pyrethroids (e.g. permethrin). Self-dusting of hens and cattle can be problematic: dosing of each animal depends on its behavior, which is unpredictable and therefore unknown. And this can come in conflict with maximal residue limits and animal safety regulations. Since dosing is unpredictable, efficacy can be unpredictable too, and it is likely that some animals may remain unprotected. These are reasons why such self-treatment practices have strongly declined in many countries in favor of newer more effective and convenient products. Another reason is that some parasites, particularly cattle horn flies and red poultry mites have developed resistance to most of the active ingredients in insecticidal dusts. This resistance is already widespread and can be very strong, especially to synthetic pyrethroids. The indoor use of insecticidal dusts can be problematic for safety reasons because dusts are quite persistent, easily get into the air and are inhaled. If this becomes a regular situation it can be harmful for livestock and operators. Cattle rubs (also called back rubbers, fly wipes, oilers, etc.) are devices that include a fabric impregnated with insecticides against which cattle rub their skin. Cattle (and many other animals) naturally enjoy rubbing against rough or coarse surfaces. Decades ago cattle farmers took advantage of this spontaneous behavior putting insecticide-impregnated cattle rubs in their ranches. Such cattle rubs consist e.g. in two upright posts (or closer tree trunks, fences, etc.) supporting a horizontally hanging chain or cable covered by a fabric impregnated with an insecticide. They are placed in places frequently visited by cattle (water troughs, salt and mineral stations, etc.). Cattle will rub against it treating themselves with the insecticide. The insecticides used to impregnate the fabric contain mostly old generic active ingredients such as organophosphates (e.g. coumaphos, malathion), carbamates (e.g. carbaryl, propoxur), and synthetic pyrethroids (e.g. permethrin). Cattle rubs are used mainly against flies (mainly horn flies and face flies, etc.). Cattle rubs are problematic for the same reasons as previously mentioned for dust bags. The dose of insecticide that each animal receives depends on its behavior, which is unpredictable and therefore unknown. And this can come in conflict with maximal residue limits and animal safety regulations. Since dosing is unpredictable, efficacy is unpredictable too, and it is likely that some animals may remain unprotected. Cattle rubs are not effective to protect cattle against other parasites suchas ticks, mites and other fly species (e.g. stable flies), which means that additional parasiticide treatments are often required. In some countries a few old products have so far survived the regulatory pressure and remain approved for use on cattle rubs, but in most countries such products (at least their use on cattle rubs) have been phased out. Unfortunately, off-label use of other products (even agricultural pesticides) on cattle rubs is sometimes practiced, without specific use instructions and with the risk of infringing residue or animal welfare regulations.